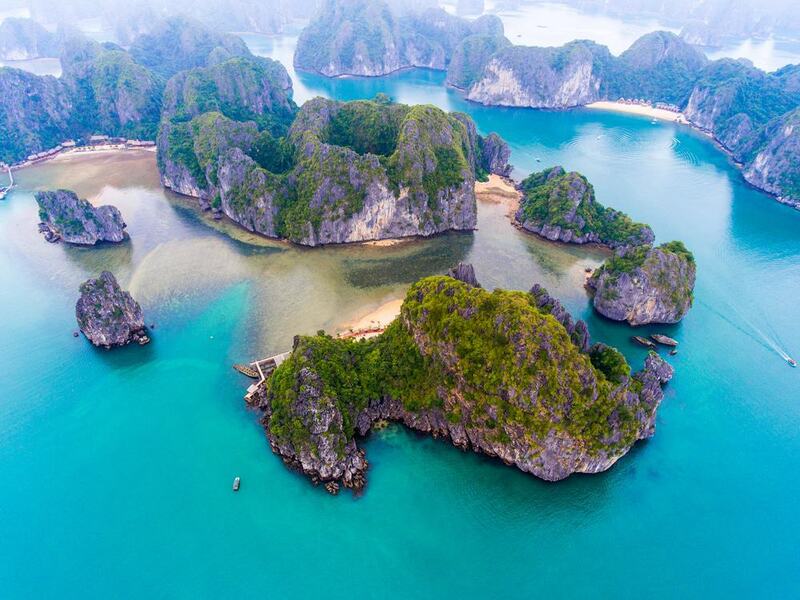 This journey will bring you to a new side of Ha Long Bay. Starting from Red River out of Hanoi city we cycle to the famous UNESCO world heritage site of Ha Long Bay. We cruise on crystal clear water to beautiful Cat Ba island and visit one of the world's biosphere reserves, Cat Ba National Park. Here we'll be treated to green jungle and beautiful scenery, we spend the night on the beach before we cycle along the coast to meet our next boat. This one takes us to the newly discovered Thien Long cave before we head back to Hanoi. Spend The Night On The Beach Before You Cycle. Ultimate Odyssey's tour guide meet you at your Hanoi hotel early in the morning for a short transfer out of the city's busy roads. We have a nice and easy start with a cycle on a dyke of the Red River. First we ride towards Bac Ninh, known for the eight Kings of the Ly Dynasty, we will see many examples of traditional architecture and agriculture practices. After that, we will stop for a local lunch at a local restaurant, where we'll also have time to relax. After lunch we continue cycling through small villages that dot rural Vietnam. Our riding ends in the early afternoon with a transfer of 2.5 hours to the port city of Ha Long. A morning cruise through Ha Long Bay on a traditional junk will give time to enjoy the beautiful scenery. Once we dock on Cat Ba Island we are back on the bikes around Cat Ba Island. We ride through a valley of tropical rain forest and hear the bird song of many species. We'll take a break for a short trek to the top of Ngu Lam Mountain where we'll have a view of the green tree-covered limestone peaks. Take you deep breath and cycling to your hotel in Cat Ba town with views across the bay. 8:00 Our tour guide and car will pick you up from your hotel in Cat Ba island go to Cat Ba National park. 8:30 – 12:00 It takes you 3 & half hours to trekking through the mountain rainforest and valley to frog lake. Along the way you have a chance to see native cats, squirrels, spotted dear, snakes, thousands of butterflies, Cat Ba Langur if you are lucky. 12:30 Have lunch in Viet Hai village with home cooked food. 14:00 to 15:30 Hiking around the village to meet local people, see them do farming, experience the local life. 15:30 to 16:30 Hiking pass the rice field and valley to Viet Hai habor, get on the boat to enjoy Lan Ha bay landscape on the way back to Cat Ba. We ride follow the coast and ride past fishing villages to Cai Vieng Pier. Then in a sampan cruise through a mangrove forest to Thien Long Cave found in 1998. Then a boat ride takes us in a ferry to Hai Phong. We get back to our bike and our car will take us back to Hanoi. Your tour ends in Hanoi. Ultimate Odyssey would love to meet you again! Routes: There are some parts of the ride that could be busy with traffic, please always follow your guide’s instructions for a safe ride. The cycling route can be changed due to external circumstances such as weather. Enjoy your riding speed from 10km per hour up to as many more as you can. If you would like easy cycling mode, whenever you feel tired, just jump on the minivan.